A while back I shared a video with 5 vegan snacks which are all sweet and today I’m following up with the savoury edition. 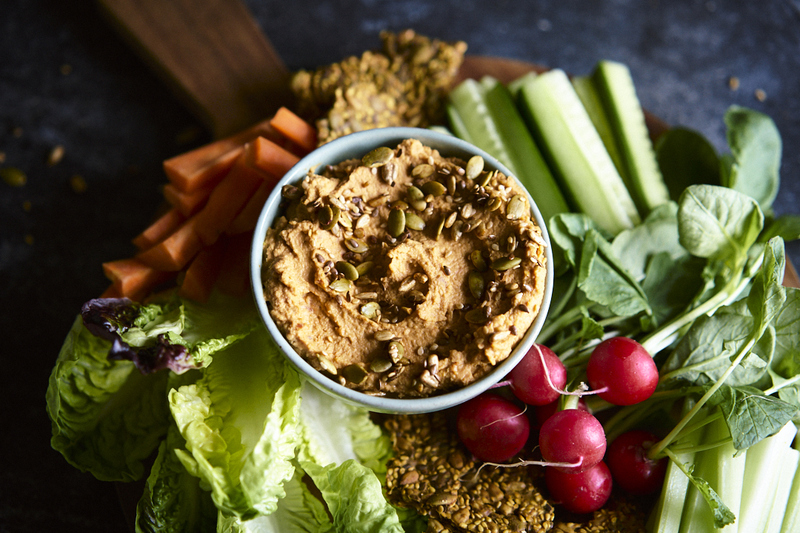 We all need some crunchy goodness in our lives and not everyone has a sweet tooth so this one is for all of us. 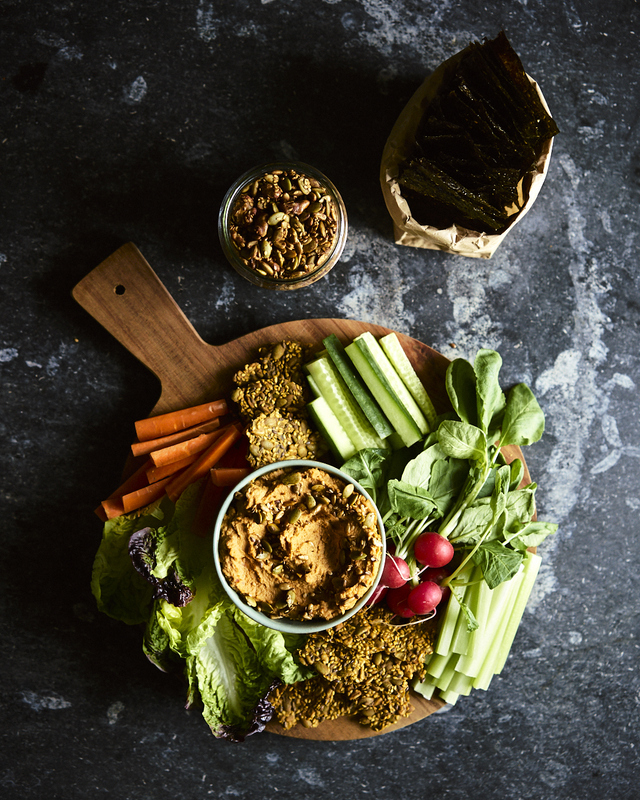 I have toasted seed and nut mix, crunchy seed crackers, nori snacks, my favourite bean dip and crispy chickpeas. 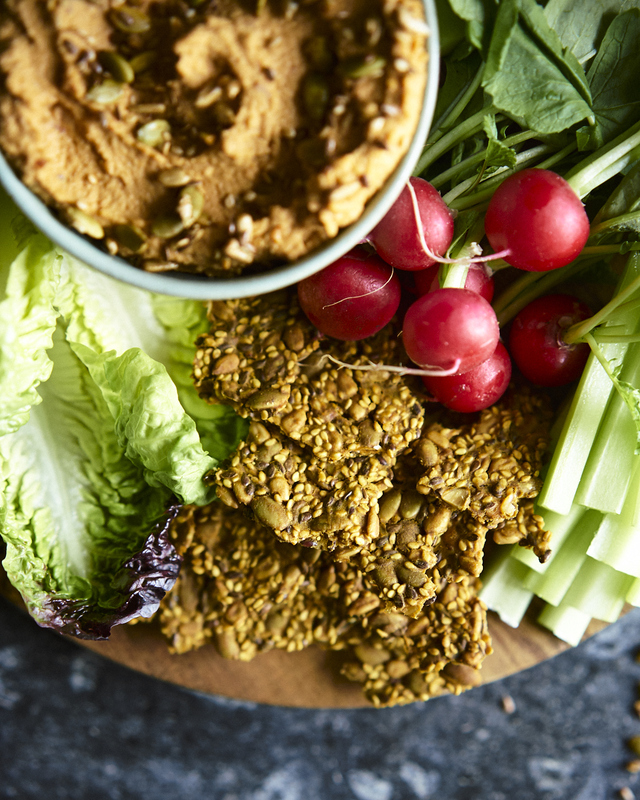 They’re all pretty easy to make and many can be prepped when you get yourself ready for the week ahead, leaving you with snack galore to see you through. 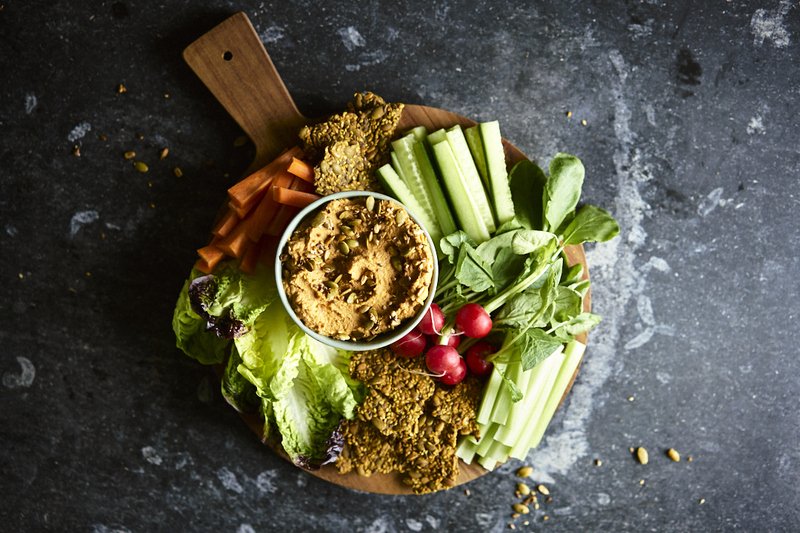 Looking for more plant based snack and meal ideas? Check out my week of series: 5 breakfasts, 5 lunches and 5 dinners as well as 5 sweet snacks. Makes a medium sized jar full. 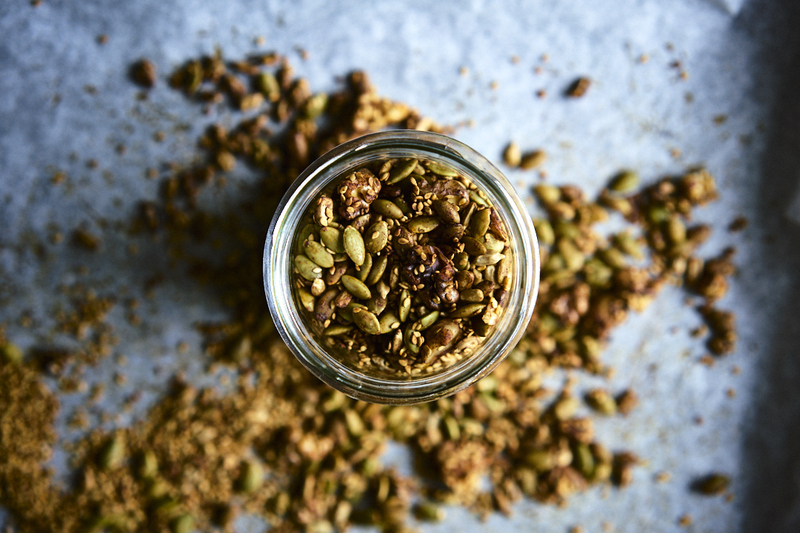 Place all your nuts and seeds in a mixing bowl and add your flavourings to the mix. Give it a good stir to coat the seeds and nuts. 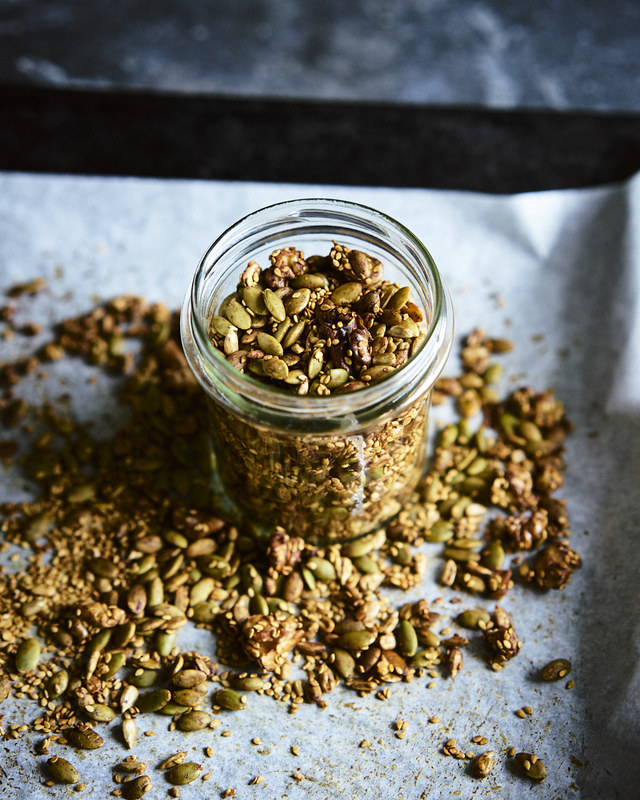 Spread your seed and nut mixture onto a lined baking tray and place in the middle of the oven for roughly 12 minutes, flipping halfway. Let cool for a minute and then store in an airtight jar for up to a month. 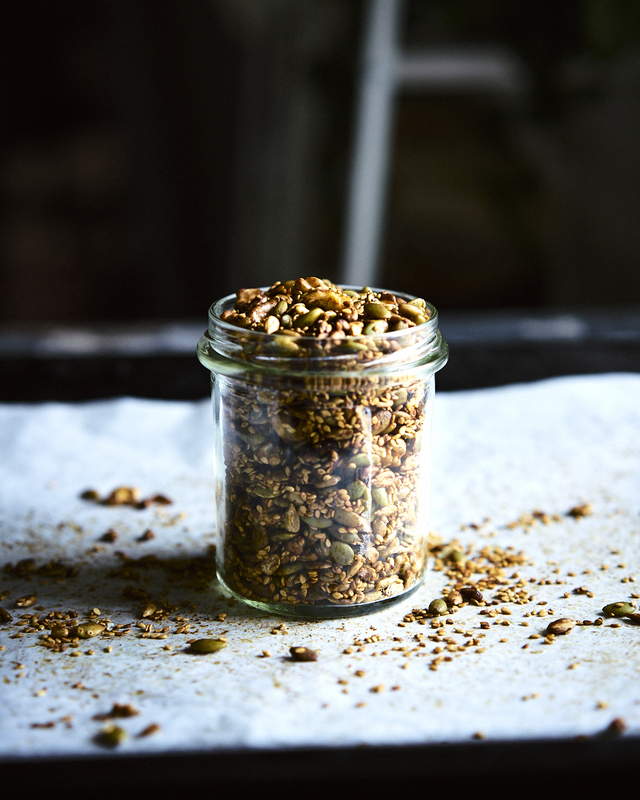 This mixture is great as a snack of course but also delicious as a topping for soups and salads making it a versatile addition to your pantry, and perfect for meal prepping. Makes 2 small baking trays. Boil your kettle, you will need one cup of boiling water for this recipe. Place all your dried ingredients in a mixing bowl and stir to combine. Then add the oil as well as hot water while mixing it into the dry mixture. This will create a lose seeded batter. 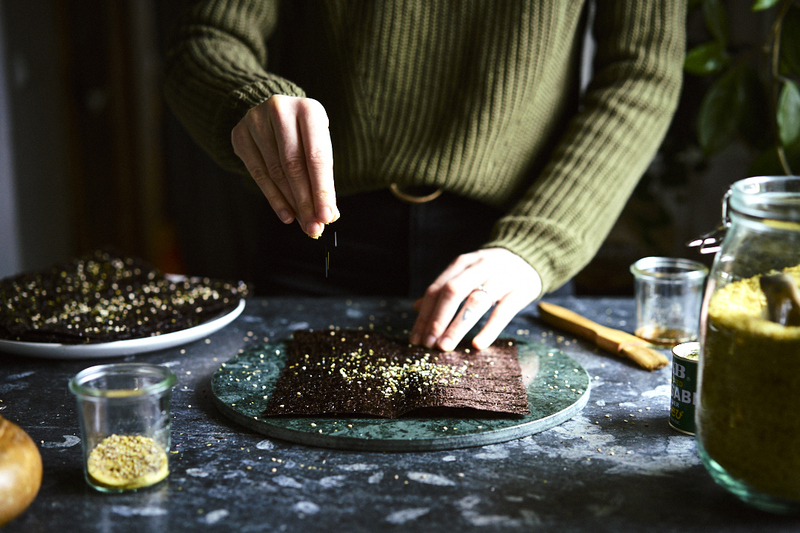 Let the mixture sit on the counter for 15 minutes, this will allow the flaxseeds to start to gel and create a binder for your crackers. Line two baking trays and divide the batter onto them. Smooth it out as thin as you can using a spatula. Try not to leave any holes in the crackers at this stage. Sprinkle some sea salt flakes onto your crackers if you enjoy a salty snack. Then bake at the centre of the oven fro anywhere between 60-90 minutes. You’ll want to keep an eye on them after 60 minutes to make sure they go golden and crisp but not burnt. You might also want to rotate your trays after those first 60 minutes to get an even bake, depending on how even your oven’s heat distribution is. Let your crackers cool and then break them into the size you like them. Maked 60 small snack sheets. 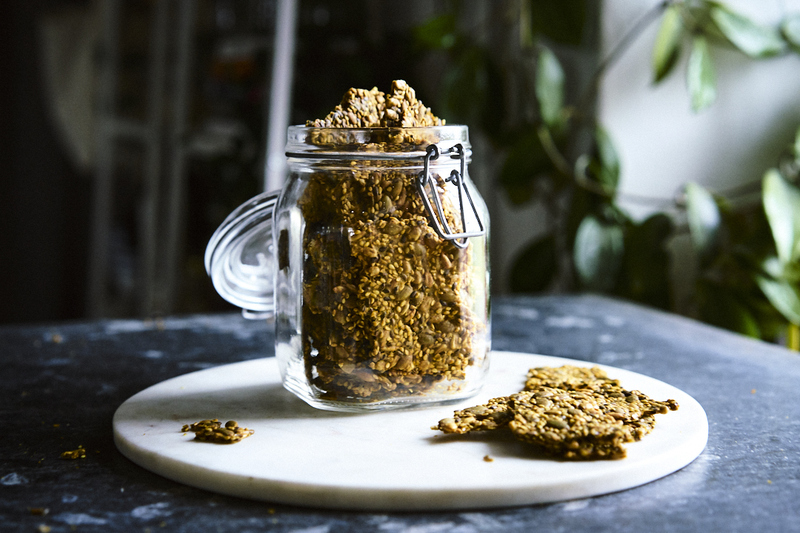 Mix the sesame seeds, nutritional yeast and salt together in a little jar or glass and mix well. You might have some left over at the end of this so keep any leftovers for your next batch. 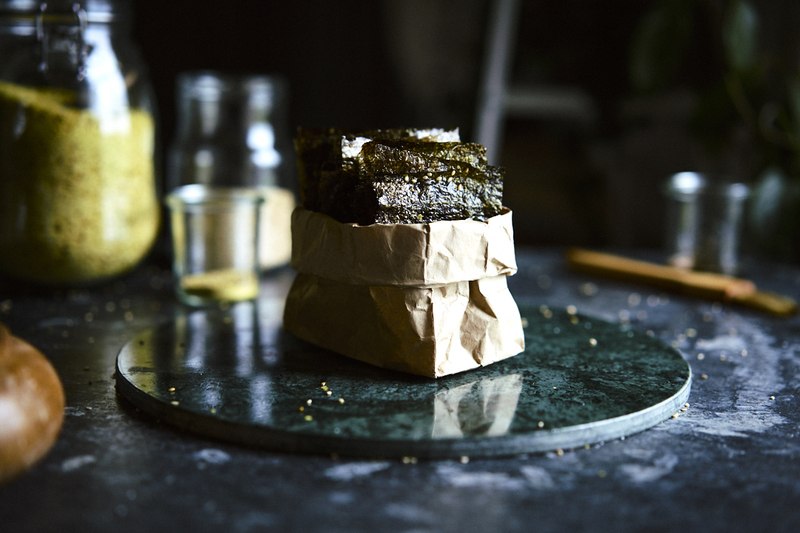 Open your nori sheets up, rough side up, and brush that side with oil. You only need a small amount for each sheet, so again you might actually need less than 1 tbsp oil for ten sheets. 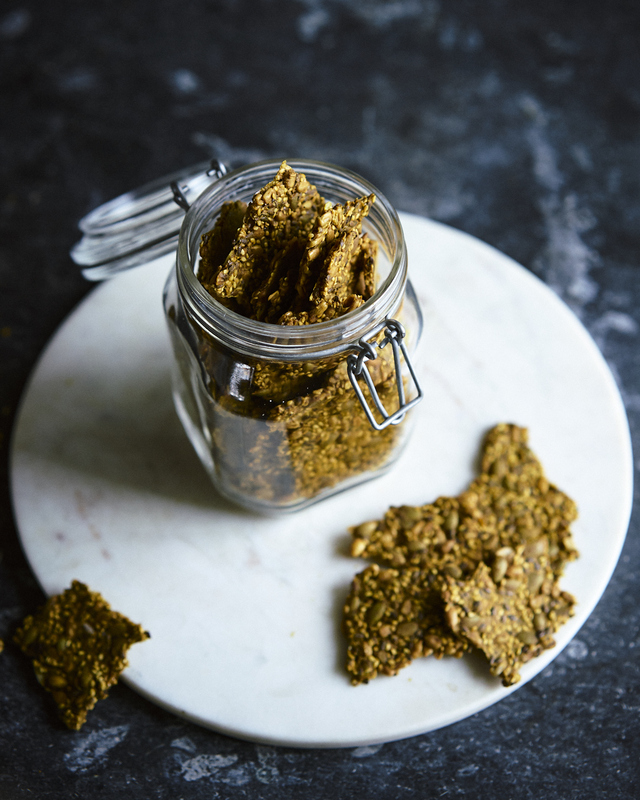 After brushing with oil take a good pinch of your flavouring mixture and sprinkle onto the sheet evenly. 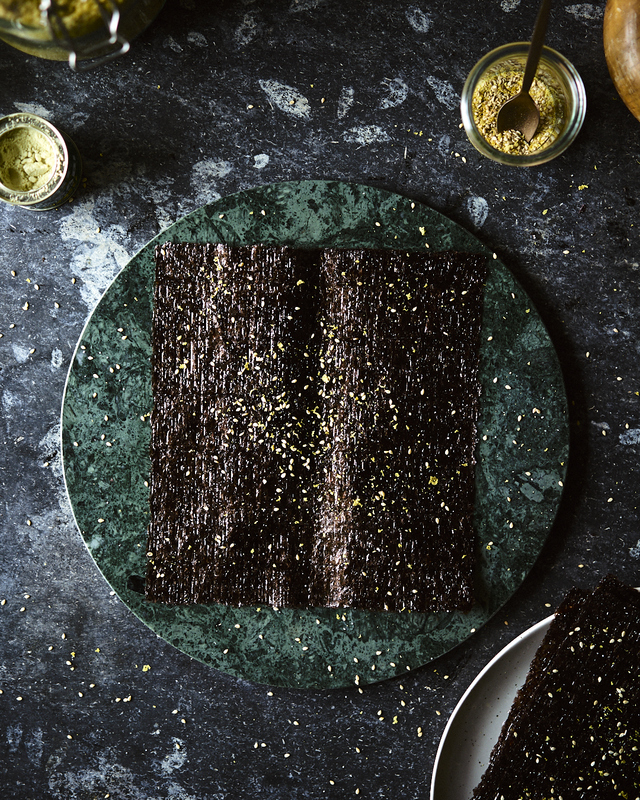 Set the sheet aside and repeat on the other nori sheets. Heat a skillet or frying pan over medium heat. 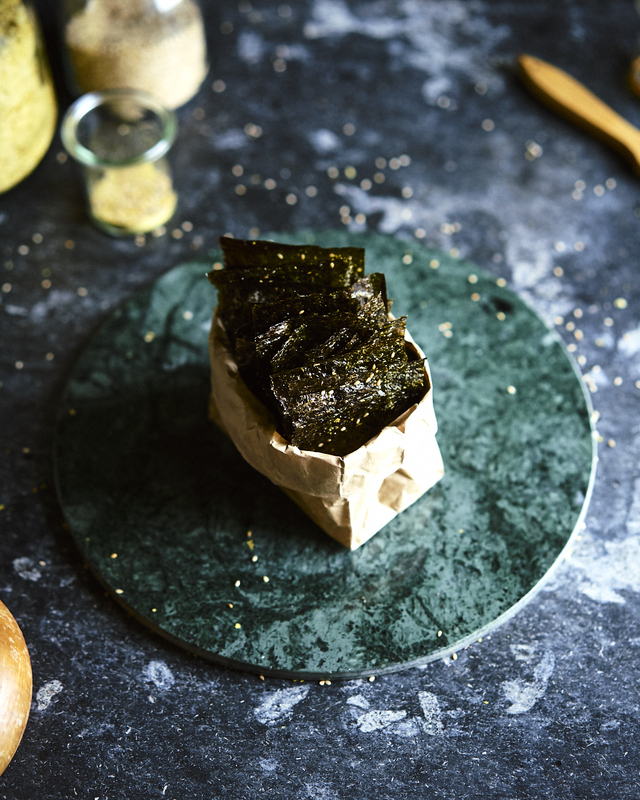 Once hot place your first nori sheet flavour side down into the pan. Press the sheet down with a spatula and toast for a minute or two, when the sheet is getting shinier and changes colour somewhat, it usually goes from black to green, it’s time to flip. Toast for another minute and then set aside, repeat with the rest of the sheets. Cut the sheets in half length ways and then each half into three smaller rectangles. Store in an air tight container for about a month. You can definitely eat 6-12 of these a day if you wanted too. Sea vegetables are a great vegan source of iodine which is important for thyroid function among other things. It is also rich in other minerals and this is a yummy way of incorporating more of them into your diet. If you wanted you could also cut these up into small strips or flakes and sprinkle on noodles soups or salads as well. Yields 1 small serving bowl of dip. Place all the dip ingredients into the bowl of your food processor and process until smooth. If you want it a little smoother and less thick you can add a splash of water. Place in a bowl, make a nice swirl in the top and if you wanted to you could sprinkle some seeds, herbs or spices on top. 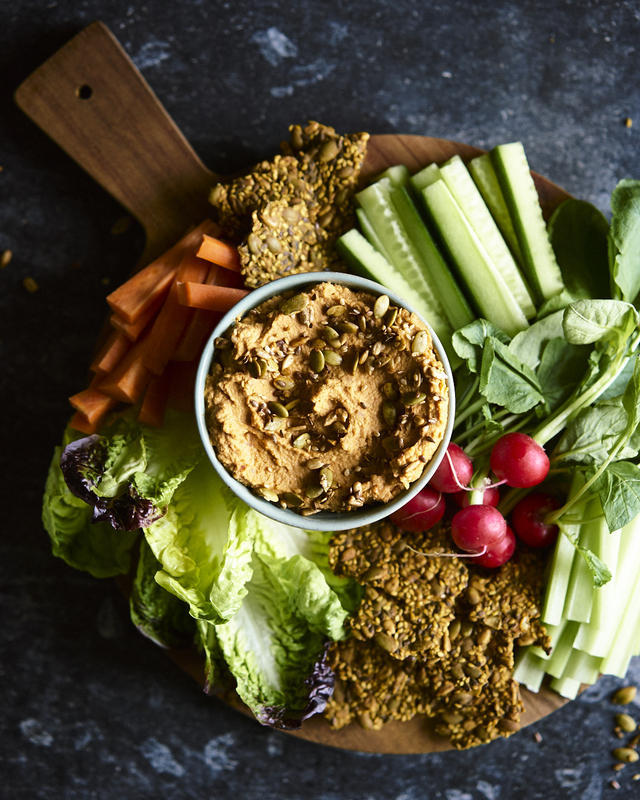 Serve with crackers or raw veggies for an easy snack or wow your friends and family with a nice platter filled with colourful vegatables and crackers to dip. 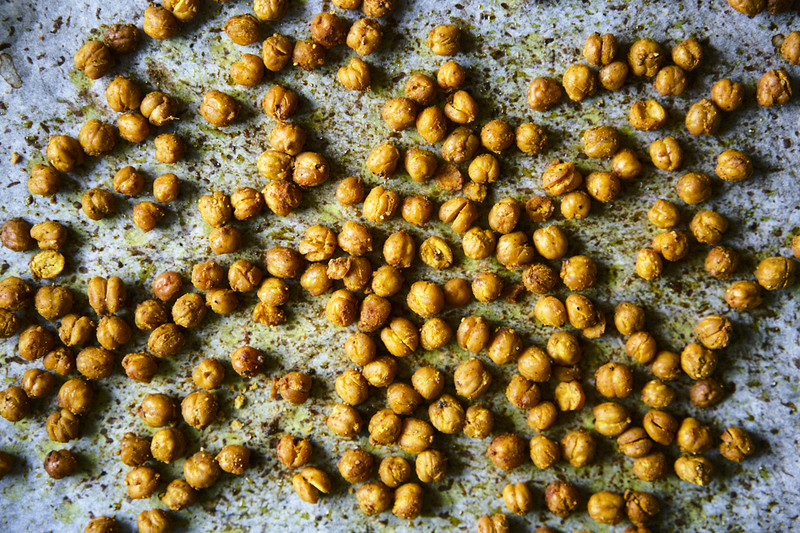 Place your drained and rinsed chickpeas onto a clean kitchen towel. Fold the towel over the chickpeas and roll your hands across the peas through the towel gently to dry. When you open the towel you’ll probably notice that some whitish sea through peels have come off some of the chickpeas. Continue to remove these peels off of most or all of the chickpeas. This will ensure they get super crispy. 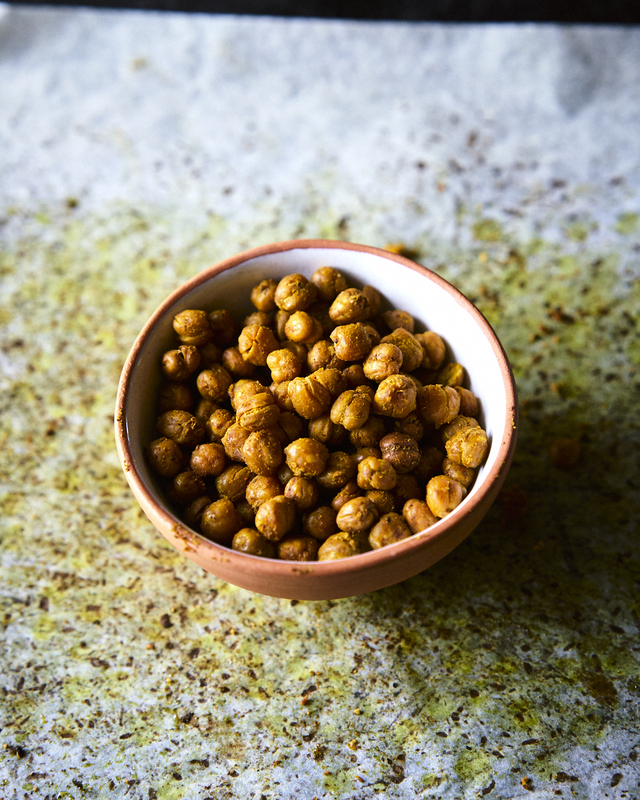 Once peeled place the chickpeas into a bowl and add the oil and spices. Mix well before spreading out on a lined baking tray. Bake at the centre of the oven for roughly 45-55 minutes or until crispy. These all look super delicious. Can’t wait to try them out. Tried the toasted nuts and seeds, as well as the chickpeas. Both turned out very delicious. Thanks and greetings from Canada!